The lodge is located on the west end of a remote 17 km long wilderness lake, just 20 flight minutes from Yellowknife - capital of Canada’s Northwest Territories - and a few kilometers north of the east arm of the Great Slave Lake. Fly-in by ski-equipped Cessna/Otter charter aircraft. On crisp winter nights, the Northern Lights, the moon and the stars light your way on snow covered paths. There are no roads, there’s no traffic, and though you still have access to high-speed internet and satellite radio - the world and its cares seem a long way away. The spacious, handcrafted log lodge and the five comfortable log cabins may accommodate up to 35 clients and offers a blend of rustic charm and modern comfort. Gourmet meals and the list of fine wines share rave reviews with our spectacular and unique displays of the Aurora Borealis. Blachford Lake Lodge is one of the north's premiere all season and special events eco lodge. 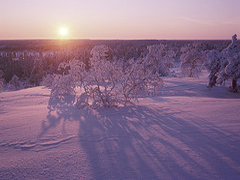 In winter enjoy dog mushing, snowmobiling, ice-fishing, skating, cross-country skiing and snowshoeing. Visitors experience the Northern Lights playing directly over the Lodge in awesome multi-colored displays. You’ll have an exclusive, front row seat for nature’s own light show after dark. The "lights" have been around since the earth formed an atmosphere… since the times of dinosaurs. The Aurora Borealis is at its very best and most intense in the Northwest Territories, Alaska and the Yukon Territory where we sit directly under the display. Blachford Lake boasts over 240 potential Aurora Borealis viewing nights. The nightly displays depends on two things: high activity on our sun, and clear weather on earth. Our usually clear, dark winter nights make the best backdrop for the Auroras awe-inspiring shows of vivid Auroras, often dance directly overhead. 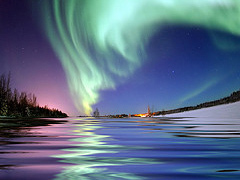 One may ask why not just stay in Yellowknife and view the Aurora Borealis ? To experience the northern lights to it’s fullest potential you have to get away from city lights and the "light glow" of any populated area. Blachford Lake Lodge is a fly-in only lodge and there are no other communities, camps or cabins within many miles. Accordingly you are in a true wilderness environment with no light obstructions to hinder your view of the Aurora. The main lodge was designed with exceptional aurora viewing in mind. All bedrooms offer prime viewing as do the dining and lounge areas, the aurora room, decks, sauna deck and hot tub. Our two night package includes a special Aurora educational workshop and a basic photography presentation, free Aurora Watch (wake up) service, "Tire sur la neige feast" (Maple Sugar on Snow) and an interpretive cross-country ski, snowshoe or hiking trip. The five night package include fabulous Aurora evening at our cozy, heated tent frame on nearby Grace Lake, complete with campfire, snowmobile rides, hot drinks and Aurora photo opportunities. 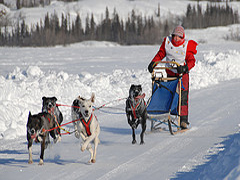 It also includes a special Aurora education/photography presentation, free Aurora Watch (wake up) service, the "Tire sur la neige feast" (Maple Sugar on Snow), and a dog mushing experience, either in Yellowknife or at Blachford Lake. Due to unpredictable weather conditions we recommend to fly-out from Yelowknife to your final destination one day later. Important Note: when comparing rates please consider that most companies do not include the mandatory 15% tax in their advertised rates.